Proinflammatory and proapoptotic cytokines such as TNF-α are upregulated in human obesity. We evaluated the association between ghrelin isoforms (acylated and desacyl ghrelin) and TNF-α in obesity and obesity-associated type 2 diabetes, as well as the potential role of ghrelin in the control of apoptosis and autophagy in human adipocytes. Plasma concentrations of the ghrelin isoforms and TNF-α were measured in 194 participants. Ghrelin and ghrelin O-acyltransferase (GOAT) levels were analysed by western-blot, immunohistochemistry and real-time PCR in 53 biopsies of human omental adipose tissue. We also determined the effect of acylated and desacyl ghrelin (10 to 1,000 pmol/l) on TNF-α-induced apoptosis and autophagy-related molecules in omental adipocytes. Circulating concentrations of acylated ghrelin and TNF-α were increased, whereas desacyl ghrelin levels were decreased in obesity-associated type 2 diabetes. Ghrelin and GOAT were produced in omental and subcutaneous adipose tissue. Visceral adipose tissue from obese patients with type 2 diabetes showed higher levels of GOAT, increased adipocyte apoptosis and increased expression of the autophagy-related genes ATG5, BECN1 and ATG7. In differentiating human omental adipocytes, incubation with acylated and desacyl ghrelin reduced TNF-α-induced activation of caspase-8 and caspase-3, and cell death. In addition, acylated ghrelin reduced the basal expression of the autophagy-related genes ATG5 and ATG7, while desacyl ghrelin inhibited the TNF-α-induced increase of ATG5, BECN1 and ATG7 expression. Apoptosis and autophagy are upregulated in human visceral adipose tissue of patients with type 2 diabetes. Acylated and desacyl ghrelin reduce TNF-α-induced apoptosis and autophagy in human visceral adipocytes. The online version of this article (doi: 10.1007/s00125-012-2671-5) contains peer-reviewed but unedited supplementary material, which is available to authorised users. Ghrelin, a 28 amino-acid peptide with an n-octanoyl group at the serine 3 residue, is the endogenous ligand of the growth hormone secretagogue receptor (GHS-R) [1, 2]. Ghrelin is synthesised predominantly in X/A cells of the oxyntic glands in the mucosa layer of the gastric fundus and secreted to the bloodstream in two major forms: acylated (∼5% of total ghrelin) and desacyl ghrelin (the form lacking n-octanoylation and representing ∼95% of total ghrelin) [1, 3, 4]. The porcupine-like enzyme ghrelin O-acyltransferase (GOAT) catalyses the octanoylation of ghrelin in the endoplasmic reticulum (ER) [3, 4] and belongs to the family of membrane-bound O-acyltransferases (MBOAT) . The expression sites of Mboat4, the gene encoding GOAT, in rodents include stomach, intestine, colon and testis, while in humans MBOAT4 is mainly expressed in stomach, intestine and pancreas [3, 4, 5]. Acylated and desacyl ghrelin increase adiposity and body weight through central and peripheral mechanisms . On the one hand, ghrelin increases food intake by activating hypothalamic neuropeptide Y/agouti-related peptide neurons, which produce GHS-R type 1a, via the modulation of fatty acid metabolism . On the other hand, adipose tissue is also an important target for the adipogenic actions of ghrelin in rodents and humans [8, 9]. Thus ghrelin (GHRL) gene expression increases during adipogenesis with preproghrelin knockdown reducing insulin-mediated adipogenesis in 3T3-L1 adipocytes . Moreover, acylated and desacyl ghrelin directly stimulate the production of several fat storage-related proteins, including acetyl-CoA carboxylase, fatty acid synthase, lipoprotein lipase and perilipin, in human visceral adipocytes, thereby stimulating intracytoplasmic lipid accumulation [8, 10]. The excessive expansion of adipose tissue during the onset of obesity results in the activation of death receptors and mitochondrial pathways, leading to the activation of effector caspases and adipocyte apoptosis [11, 12]. Other types of cell death, namely autophagy, have been recently shown to be altered in adipose tissue in obesity . Autophagy is a dynamic self-degrading process, characterised by sequestering of cytosolic organelles and proteins in double-membrane vesicles, which are known as autophagosomes and translocate to lysosomes for fusion and content degradation . The proteins encoded by autophagy-related genes (ATG) are required for the formation of autophagic vesicles. Given the anti-apoptotic action of ghrelin in several cell systems, including murine 3T3-L1 adipocytes [15, 16, 17], it seems plausible that ghrelin operates as a survival factor that prevents obesity-associated apoptosis and autophagy in human adipocytes. We therefore sought to: (1) characterise the production and regulation of the ghrelin–GOAT system in human adipose tissue; and (2) analyse the effect of acylated and desacyl ghrelin on basal and TNF-α-induced apoptosis, and on autophagy in human visceral adipocytes. The study of acylated and desacyl ghrelin plasma levels was performed in a population of 194 participants (111 men, 83 women). BMI was calculated as weight in kilograms divided by the square of height in meters. Obesity was defined as a BMI of ≥30 kg/m2 and normal weight as a BMI of <25 kg/m2. Obese patients were sub-classified into three groups (normoglycaemia, impaired glucose tolerance or type 2 diabetes) following the criteria of the Expert Committee on the Diagnosis and Classification of Diabetes . Participants with type 2 diabetes were not on insulin therapy or medication likely to influence endogenous insulin levels. 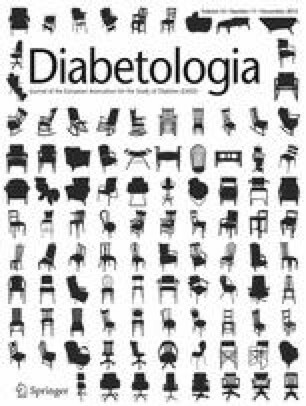 It should be stressed that the type 2 diabetic patients included in our obese group did not have a long history of diabetes (less than 2 to 3 years, or even de novo diagnosis on the basis of their anamnesis and biochemical determinations). The clinical characteristics of the participants are shown in Table 1. In addition, the presence of ghrelin and GOAT, and the effect of the ghrelin isoforms were assessed in paired omental and subcutaneous adipose tissue samples from 53 patients undergoing either laparoscopic Roux-en-Y gastric bypass (n = 43) or Nissen fundoplication (n = 10) at the Clínica Universidad de Navarra. The clinical characteristics of this cohort were essentially similar to those of the cohort in which circulating ghrelin isoforms were studied (Electronic supplementary material [ESM] Table 1). All reported investigations were carried out in accordance with the principles of the Declaration of Helsinki as revised in 2008. The experimental design was approved from an ethical and scientific standpoint by the Research Ethics Committee of the Clínica Universidad de Navarra, which is responsible for research (028/2009); informed consent was obtained from all volunteers. For more details see ESM. Biochemical and hormonal assays performed in the study were done as previously described [8, 10]. Insulin resistance and sensitivity were calculated using the HOMA and QUICKI indices, respectively [19, 20]. Acylated and desacyl ghrelin were determined by commercially available ELISA kits (Linco Research, St Charles, MO, USA) following the manufacturer’s guidelines, as described earlier [8, 10]. TNF-α was measured with a high-sensitivity ELISA (R&D Systems, Minneapolis, MN, USA). For more details see ESM. RNA isolation and purification were performed as described earlier [8, 21]. Transcript levels for ghrelin (GHRL), GOAT (MBOAT4) and the ATGs ATG5, BECN1 and ATG7 were quantified by real-time PCR (7300 Real-Time PCR System; Applied Biosystems, Foster City, CA, USA). Primers and probes (ESM Table 2) were designed using Primer Express 2.0 (Applied Biosystems). For more details see ESM. Blots were incubated overnight at 4°C with anti-ghrelin (Alpha Diagnostic, San Antonio, TX, USA), anti-GOAT (Santa Cruz Biotechnology, Santa Cruz, CA, USA), anti-caspase-3 (Cell Signaling Technology, Danvers, MA, USA), anti-cleaved caspase-3 (Cell Signaling), anti-caspase-8 (Cell Signaling) and anti-cleaved caspase-8 (Cell Signaling) antibodies (diluted 1:1,000 in blocking solution), or with anti-β-actin (Sigma, St Louis, MO, USA) antibody (diluted 1:5,000 in blocking solution). The antigen–antibody complexes were visualised using horseradish peroxidase-conjugated anti-rabbit or anti-mouse IgG antibodies (1:5,000), and an enhanced chemiluminescence detection system (ECL Plus; Amersham Biosciences, Little Chalfont, Buckinghamshire, UK). For more details see ESM. Immunohistochemical detection of ghrelin and GOAT was carried out as described before . Sections were incubated overnight at 4°C with rabbit polyclonal anti-ghrelin (Alpha Diagnostic) or rabbit polyclonal anti-GOAT (Santa Cruz Biotechnology) antibodies diluted 1:50 in TRIS-buffer saline. After three washes with TRIS-buffer saline, slides were incubated for 1 h at room temperature with horseradish peroxidase-conjugated anti-rabbit/mouse (Dako, Glostrup, Denmark). The peroxidase reaction was visualised with a 3,3′-diaminobenzidine (Amersham Biosciences)/H2O2 solution (0.5 mg/ml 3,3′-diaminobenzidine, 0.03% H2O2 diluted in 50 mmol/l TRIS–HCl, pH 7.36) as chromogen and with Harris haematoxylin solution (Sigma) as counterstaining. For more details see ESM. Differentiated human adipocytes grown on glass coverslips were fixed with 4% paraformaldehyde (wt/vol) (15 min, room temperature), incubated with PBS containing 0.1% saponin (wt/vol) and 1% BSA (wt/vol) (1 h, room temperature), and exposed overnight and at 4°C to rabbit polyclonal anti-ghrelin (Alpha Diagnostic) or anti-GOAT (Santa Cruz) antibodies diluted 1:50 (ghrelin) or 1:250 (GOAT) in PBS containing 0.1% saponin (wt/vol). Thereafter, cells were washed with PBS and incubated at room temperature for 2 h with Alexa Fluor 488-conjugated donkey anti-rabbit IgG (Invitrogen, Paisley, UK) diluted 1:500. After washing, coverslips were mounted on microscope slides and examined under a confocal laser scanning microscope (TCS-SP2-AOBS; Leica, Heidelberg, Germany). For more details see ESM. Human stromovascular fraction cells (SVFC) were isolated from omental adipose tissue from obese normoglycaemic participants and differentiated as previously described . Differentiated human omental adipocytes were serum-starved for 24 h and then treated for 24 h with increasing concentrations of insulin (Sigma), leptin (PeproTech, Rocky Hill, NJ, USA), TNF-α (PeproTech), acylated ghrelin (Tocris, Ellisville, MO, USA) or desacyl ghrelin (Tocris). In a subset of experiments quiescent cells were incubated for 24 h with TNF-α (100 ng/ml) in the presence or absence of acylated ghrelin (100 pmol/l) or desacyl ghrelin (100 pmol/l). One sample per experiment was used to obtain control responses in the presence of the solvent. For more details see ESM. The TUNEL assay was performed using an in situ cell death detection kit (POD; Roche, Basel, Switzerland) following the manufacturer’s instructions. TUNEL-positive cells were analysed under the light microscope. For more details see ESM. Data are expressed as mean ± SEM. Statistical differences between mean values were determined using Student’s t test, a χ2 test and one-way ANOVA, followed by Scheffé’s or Dunnet’s tests where appropriate. A value of p < 0.05 was considered statistically significant. Due to their non-normal distribution, plasma concentrations of acylated and desacyl ghrelin, and TNF-α were logarithmically transformed (log10) for statistical analyses. In the analysis of Pearson’s correlation coefficients (r), Bonferroni’s correction was applied when multiple comparisons were performed simultaneously, establishing the significance level at p = 0.003. For more details see ESM. Obese participants showed increased circulating concentrations of acylated ghrelin (obese 5.1 ± 0.3, lean 3.9 ± 0.3 pmol/l [mean ± SEM], p = 0.013) and decreased circulating concentrations of desacyl ghrelin (obese 90.9 ± 4.7, lean 168.1 ± 15.6 pmol/l, p < 0.001) compared with lean individuals (Fig. 1a, b). Acylated ghrelin levels were also higher (p < 0.01) in obese individuals with type 2 diabetes than in obese participants with normoglycaemia or impaired glucose tolerance (Fig. 1a). No effect of glucose intolerance or diabetes was observed on circulating desacyl ghrelin concentrations. Plasma desacyl ghrelin concentrations were increased in women compared with men in the lean group (women 192.5 ± 13.6, men 133.3 ± 13.8 pmol/l, p < 0.001) and in the obese group (women 104.3 ± 12.1, men 88.6 ± 9.4 pmol/l, p < 0.001). This sexual dimorphism was not found in the plasma acylated ghrelin levels of lean participants (women 3.8 ± 0.4, men 4.2 ± 0.5 pmol/l) or in those of the obese patients (women 4.7 ± 0.4, men 5.3 ± 0.3 pmol/l). Type 2 diabetes was associated with increased circulating levels of well-known inflammatory markers, including TNF-α (Table 1). Interestingly, no correlation was observed between acylated ghrelin and TNF-α (Fig. 1c), whereas desacyl ghrelin showed a negative correlation (r = 0.23, p < 0.05) with this proinflammatory cytokine (Fig. 1d). To analyse whether adipose tissue is a production site of ghrelin and its acylating enzyme, GOAT, the presence of both molecules was analysed in biopsies of omental and subcutaneous adipose tissue from lean and obese patients. Analysis was performed by western-blot and real-time PCR. Omental adipose tissue of obese participants showed similar gene expression of ghrelin (p = 0.800), but increased transcript levels of MBOAT4 (p < 0.01) compared with lean individuals (Fig. 2a). Furthermore, transcript levels of GOAT were higher (p < 0.05) in obese individuals with type 2 diabetes than in normoglycaemic patients. No differences in GHRL and MBOAT4 mRNA in subcutaneous fat were found between the lean and obese groups (Fig. 2b). The levels of ghrelin and GOAT in omental and subcutaneous fat depots exhibited a similar pattern to that observed in the gene expression analyses (Fig. 2c, d). A positive correlation between MBOAT4 mRNA levels and serum LDL-cholesterol in omental adipose tissue (r = 0.71, p = 0.002) was found. To identify the cell type responsible for ghrelin and GOAT production, the presence of both molecules in omental adipose tissue was evaluated by immunohistochemistry and real-time PCR. Positive black staining for ghrelin and GOAT was observed in fully mature adipocytes, as well as in the SVFC of omental and subcutaneous fat depots from obese patients (Fig. 2e, f). Adipocytes and SVFC showed similar (p > 0.05) transcript levels for ghrelin and GOAT in omental (GHRL 1.00 ± 0.67 vs 0.38 ± 0.26 arbitrary units [AU]; MBOAT4 1.00 ± 0.40 vs 0.70 ± 0.43 AU) and subcutaneous (GHRL 1.00 ± 0.45 vs 1.52 ± 0.36 AU; MBOAT4 1.00 ± 0.53 vs 0.82 ± 0.33 AU) adipose tissue. To gain more insight into the localisation of ghrelin and GOAT, the subcellular localisation of both proteins was studied in differentiated human adipocytes using confocal immunofluorescence microscopy. As shown in Fig. 2g, ghrelin and GOAT exhibited a cytoplasmic distribution in adipocytes. More specifically, the ghrelin immunosignal surrounded the nucleus and appeared as ring-shaped structures at the periphery of lipid droplets, which is morphologically reminiscent of the appearance of the ER. A similar intracellular distribution was observed for GOAT immunoreactivity (Fig. 2g). No immunoreaction was detected when primary or secondary antibodies were omitted. Given the increased abundance of GOAT in omental adipose tissue and the metabolic relevance of this fat depot , the subsequent experiments focused on this fat depot. To gain insight into the regulation of ghrelin and GOAT production, the roles of insulin and leptin, two hormones that are tightly associated with obesity and obesity-associated type 2 diabetes and have opposite effects on fat deposition, and the role of the proinflammatory cytokine, TNF-α, were analysed as plausible regulators of the expression of GHRL and MBOAT4 in human omental adipocytes (Fig. 3a–f). GHRL expression was reduced (p < 0.05) by increasing concentrations of insulin and leptin, but augmented (p < 0.05) in response to TNF-α in human visceral fat cells. MBOAT4 transcript levels increased (p < 0.05) in response to insulin, while neither leptin nor TNF-α modified them. The self-regulation of ghrelin in human visceral fat cells was also tested (Fig. 3g–j). GHRL expression was downregulated (p < 0.01) by desacyl ghrelin and upregulated (p = 0.019) by acylated ghrelin. MBOAT4 transcript levels in human visceral adipocytes were significantly increased (p < 0.01) by acylated ghrelin treatment at all the concentrations tested. TUNEL assays were initially performed to analyse adipocyte apoptosis in human omental adipose tissue from a well-characterised group of lean and obese participants. Adipocyte apoptosis was markedly increased (p < 0.0001) in the visceral adipose tissue of obese participants (Fig. 4a and b), which is in agreement with previous reports . The quantification of TUNEL-positive cells showed that adipocyte apoptosis was further increased (p < 0.05) in adipose tissue of obese type 2 diabetes patients compared with normoglycaemic obese participants. We evaluated the effect of acylated and desacyl ghrelin on TNF-α-induced caspase activation by examining the appearance of cleaved caspase-8 and caspase-3, while apoptosis was explored by detecting DNA fragmentation with the TUNEL assay. As expected, the incubation of human visceral fat cells with different concentrations of TNF-α for 24 h significantly (p < 0.001) increased the activation of caspase-8 and caspase-3, and apoptotic cell death (Fig. 4c, d and e). The co-incubation with desacyl ghrelin (100 pmol/l) or acylated ghrelin (100 pmol/l) significantly reduced the cleavage of caspase-8 and caspase-3, as well as the apoptotic indices induced by TNF-α (100 ng/ml) (Fig. 4f, g and h). To study the regulation of autophagy in obesity, we first examined the expression patterns of several molecular indicators of autophagy (ATG5, ATG7 and Beclin-1/ATG6) in human visceral adipose tissue from lean and obese participants. Obese patients with type 2 diabetes showed significantly (p < 0.05) increased transcript levels of ATG7 and BECN1 in omental adipose tissue compared with lean controls and normoglycaemic obese individuals (Fig. 5b, c). The expression of ATG5 showed a similar trend in obesity-associated type 2 diabetes, but differences did not reach statistical significance (p < 0.10) (Fig. 5a). Adipocytes and SVFC isolated from omental adipose tissue of morbidly obese patients were used to identify which cell type expressed the ATGs in this fat depot. No statistically significant differences were observed in the transcript levels of ATG5, ATG7 and BECN1 in adipocytes and SVFC (Fig. 5d–f). To determine whether acylated and desacyl ghrelin, and TNF-α directly affect autophagy in adipose tissue, differentiated human adipocytes were exposed for 24 h to increasing concentrations of acylated and desacyl ghrelin in the presence or absence of TNF-α and the expression of ATG5, ATG7 and BECN1 was analysed. TNF-α upregulated (p < 0.05) these ATGs at the highest concentration tested (100 ng/ml) (Fig. 6a, e and i). The stimulation of human visceral adipocytes with desacyl ghrelin did not modify the basal expression of ATGs, but acylated ghrelin decreased (p < 0.05) the transcript levels of ATG5 and ATG7 in human visceral adipocytes (Fig. 6c and g). The co-incubation of TNF-α with acylated ghrelin returned the expression of BECN1 to basal levels, while co-incubation with desacyl ghrelin inhibited the TNF-α-induced increase in ATG5, ATG7 and BECN1 (Fig. 6d, h and l). Circulating total ghrelin levels are decreased in obesity, insulin resistance or the metabolic syndrome, all well-known low-grade chronic inflammatory diseases [23, 24, 25]. Our findings show that obesity-associated type 2 diabetes is related to low desacyl ghrelin concentrations (the most abundant form of the hormone) and high acylated ghrelin levels, which is in accordance with previously published data [8, 10]. Our study also provides evidence that acylated ghrelin correlates negatively with TNF-α. A similar relationship between ghrelin and TNF-α has been found in other pathological inflammatory conditions, such as juvenile idiopathic arthritis, rheumatoid arthritis or congenital heart disease [25, 26, 27]. Since TNF-α and ghrelin exert opposite effects on the immune system and metabolism , the present study focused on the interaction of both molecules in human adipose tissue. Despite the negative correlation of TNF-α with plasma desacyl ghrelin, we observed that TNF-α increased GHRL mRNA expression in human visceral adipocytes, suggesting that both molecules interact at the autocrine/paracrine level in fat cells. In this sense, as described below in detail, our data show that acylated and desacyl ghrelin directly act on visceral adipose tissue to regulate TNF-α-induced apoptosis and autophagy in humans. Human adipose tissue produces all the components of the ghrelin system, namely ghrelin, obestatin, GOAT, and the receptors of ghrelin-related peptides, GHS-R type 1a and G protein-coupled receptor 39 (GPR39) [8, 21, 29, 30]. Our findings show for the first time that ghrelin and GOAT are co-produced in human visceral adipocytes and SVFC. In line with this, we observed a similar intracellular distribution of ghrelin and GOAT immunosignals in human adipocytes, which resembled that observed in the ER. In this sense, it has been suggested that GOAT is located in the membrane of the ER and mediates the translocation of the octanoyl-CoA from the cytosolic side to the ER lumen prior to the transport of acylated ghrelin to the Golgi [31, 32, 33]. The subcellular localisation of ghrelin and GOAT found in the present study is similar to that observed in human myometrial smooth muscle cells and in the human embryonic kidney (HEK) 293 cell line [9, 34, 35, 36]. Further investigation is warranted to ascertain the mechanisms of ghrelin trafficking in human adipocytes. Since human obesity and obesity-associated type 2 diabetes are associated with altered levels of circulating acylated and desacyl ghrelin, the potential contribution of human adipose tissue to this dysregulation was analysed. Ghrelin mRNA levels in omental and subcutaneous adipose tissue were similar and comparable within groups, which is in accordance with data published by Knerr and colleagues . To our knowledge, the present study shows for the first time that insulin resistance rather than obesity increases the abundance of GOAT in human visceral adipose tissue, suggesting that this fat depot contributes to the acylation of ghrelin. Moreover, transcript levels of MBOAT4 in omental adipose tissue were positively associated with serum LDL-cholesterol. Interestingly, LDL-cholesterol interacts with acylated ghrelin, and a plausible role of triacylglycerol-rich LDL- and HDL-cholesterol particles as ghrelin transporters in the bloodstream has been suggested . Although correlation does not imply causality, the association between GOAT and LDL-cholesterol may reflect an increased transport of ghrelin into the bloodstream, thereby contributing to the high levels of circulating acylated ghrelin in insulin resistance. Several nutritional and hormonal factors are involved in the regulation of the ghrelin/GOAT system [29, 30]. Our data show that insulin and leptin suppressed ghrelin mRNA levels in human visceral fat cells. In this regard, perfusion of the rat stomach with insulin or leptin induced a dose-dependent inhibition of ghrelin release  and infusion of insulin at physiological doses throughout prolonged euglycaemic–hyperinsulinaemic clamps significantly decreased desacyl ghrelin in healthy participants and pregnant women with type 2 diabetes [13, 39]. Our results also show that insulin increases GOAT transcript levels in human fat cells. The existing literature on the effect of insulin on GOAT is scarce and controversial, with insulin inhibiting GOAT in INS-1 pancreatic cells, but lacking effect in murine primary pituitary cells [40, 41]. Here, we have also shown that acylated ghrelin promotes ghrelin production and acylation in human adipocytes, a finding in agreement with previously published data on murine primary pituitary cells , while desacyl ghrelin acts as a repressor of ghrelin transcription. In this sense, Mboat4 knockout mice, which lack acylated ghrelin, but otherwise exhibit physiological levels of desacyl ghrelin, showed a decreased body weight without changes in fat mass when fed a high-fat diet , which may be explained by the negative regulatory effect of desacyl ghrelin on GHRL evidenced in the present study. Taken together, insulin, leptin, TNF-α and ghrelin isoforms themselves act as transcriptional regulators of GHRL and MBOAT4 in human visceral adipocytes. Acylated and desacyl ghrelin reduce the adipocyte apoptosis induced by TNF-α, a well-known regulator of apoptosis in adipose tissue. Upon binding of TNF-α to its receptor, TNF-α proapoptotic signalling occurs, resulting in caspase-8 cleavage and activation, which further activates caspase-3, leading to adipocyte cell death . Our findings provide evidence that ghrelin isoforms reduce the activation of caspase-8 and caspase-3, and the apoptosis induced by TNF-α. In this regard, ghrelin reportedly prevented apoptosis in murine 3T3-L1 and rat adipocytes [16, 44], as well as in other cell types, such as the murine adult cardiomyocyte cell line HL-1, porcine aortic endothelial cells, rat hypothalamic neurons and cortical oligodendrocytes, rat INS-1E pancreatic beta cells, and the human adrenal gland carcinoma cell line [15, 17, 45, 46, 47]. In the present study, we also confirmed increased adipocyte apoptosis in human obesity and obesity-associated type 2 diabetes. Since adipocyte apoptosis constitutes a key initial event that contributes to macrophage infiltration into adipose tissue, insulin resistance and the hepatic steatosis associated with human obesity , the inhibition of adipocyte apoptosis by ghrelin isoforms may represent a novel potential therapeutic strategy for the treatment of obesity-associated inflammation (Fig. 7). Autophagy plays an important role in the regulation of adipose mass and differentiation [14, 48, 49], since ATG5 and ATG7 knockdown in 3T3-L1 adipocytes inhibits lipid accumulation and decreases the abundance of the adipogenic transcription factors, peroxisome proliferator-activated receptor γ and CCAAT/enhancer binding protein α (C/EBPα). Human adipose tissue contains autophagosomes and obesity is associated with altered levels of the autophagy-related molecules microtubule-associated protein 1 light chain 3 I (LC3-I) and II (LC3-II) and ATG5 . Our data provide evidence that ATG5, beclin-1/ATG6 and ATG7 are present in human adipocytes and SVFC, and that hyperglycaemia, rather than obesity, is associated with altered expression of BECN1 and ATG7 in adipose tissue of obese patients with type 2 diabetes. In this sense, insulin constitutes a major inhibitor of autophagy, with insulin resistance being a potential activator of this process, since patients with type 2 diabetes show elevated formation of autophagosomes in subcutaneous adipose tissue . The activation of autophagy in type 2 diabetes may reflect an underlying cell death of hypertrophied adipocytes . In this regard, Beclin-1/ATG6 has been proposed as a potential link between apoptosis and autophagy . Moreover, TNF-α reportedly induces the production of Beclin-1/ATG6 in vascular smooth muscle cells in atherosclerotic plaques, and Beclin-1/ATG6 is associated with cell death in the plaque . In this context, we analysed the role of the pro-apoptotic TNF-α and the anti-apoptotic ghrelin in the regulation of ATGs. TNF-α increased the transcript levels of ATG5, BECN1 and ATG7, while acylated ghrelin reduced ATG5 and ATG7 expression in human visceral adipocytes. In addition, desacyl ghrelin reduced the TNF-α-induced expression of ATG5, ATG7 and BECN1. Taken together, we have thus shown for the first time that acylated ghrelin and TNF-α exert opposite effects on the regulation of autophagy in human visceral adipocytes (Fig. 7). Furthermore, the imbalance of both molecules in hyperglycaemic states may contribute to the altered autophagy observed in patients with type 2 diabetes. In summary, the main findings of the present study are that: (1) GOAT abundance, but not that of ghrelin, is increased in human visceral adipose tissue in patients with type 2 diabetes; (2) insulin, leptin, TNF-α and ghrelin itself constitute transcriptional regulators of GHRL and MBOAT4 in human visceral adipocytes; and (3) acylated and desacyl ghrelin reduce TNF-α-induced apoptosis and basal autophagy in human visceral adipocytes. These results broaden the current understanding of the defective mechanisms underlying type 2 diabetes. We gratefully acknowledge the valuable collaboration of all members of the Department of Surgery and the Nutrition Unit of the Clínica Universidad de Navarra (Pamplona, Spain) for their technical support. This work was funded by the Instituto de Salud Carlos III (FIS PS09/02330 and PI10/01677), by grants from the Department of Health (4/2006) of the Gobierno de Navarra, Spain, by the Plan de Investigación de la Universidad de Navarra (PIUNA) (2011-2012) and by the Ministerio de Economía y Competitividad (BFU2010-17116). CIBER de Fisiopatología de la Obesidad y Nutrición (CIBERobn) is an initiative of the Instituto de Salud Carlos III, Spain. AR, JG-A, VC, FR, VV, CS, CM, MRP, RV, JS, MMM, IC and GF researched the data. AR, JG-A, VC, MMM and GF contributed to the discussion. AR and GF wrote the manuscript. All authors reviewed/edited the manuscript and approved the final version. GF is the guarantor of this work, had full access to all the data and takes full responsibility for the integrity of data and the accuracy of data analysis.